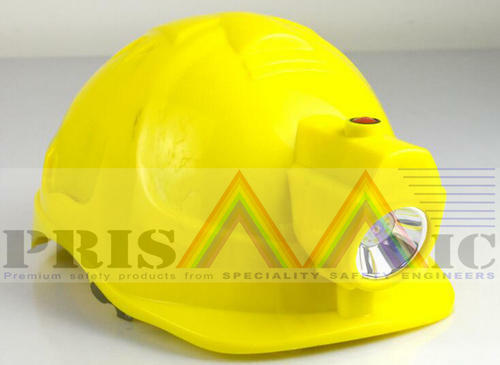 Safety helmet with head lamp is a unique blend of durability and comfort.Head Lamp helmet are most suitable for areas which demand work at low lighting conditions.The strong structure of this helmet comprises of a head lamp which has a high intensity beam. It provides protection to users who work in the dark or industrial applications which call for work in the night such as coal mining or other allied applications. This Safety Helmet with Head Lamp being light weight but sturdy offers comfort along with protection. Our Rechargeable Safety Helmet Torch is available in customised styles and colours as per customer’s demand and also quality management team, inspects and tests Safety Helmet before it is dispatched to customers. Packaging Details Standard / custom-made packaging for Domestic / Export delivery as per customer need. Speciality Safety Engineers was established in the year 2008 by a team of three people drawn from engineering, commercial and general management backgrounds with each one having a common passion of creating an organization providing specialized / customised safety products and project implementation services covering the entire gamut of products and services in the spheres of personal protection, industrial safety and public utility services. As a customer centric organization, we always strive to offer highest quality products adequately customised to serve the specific technical and commercial requirements within given budgetary constraints of our esteemed clientele. Our goal is not just to maintain a healthy business relationship with our customers but also to support them with a strong distribution and service network of channel partners and safety consultants, who can also assist in taking us forward as an organization and keeping us at the forefront of the latest in Safety.